True to form, I have not been disappointed. This album definitely still falls under the “rock” category but it seems like Mike Tramp has taken on a more low-key and mellow vibe compared to what White Lion played in the ’80s. In other words, there’s no “Lights and Thunder”, “Hungry”, “All You Need Is Rock ‘N’ Roll” or “If My Mind Is Evil”. Mike seems to have put all those heavier in-your-face kind of rock songs to bed and is content to play good ol’ rock ‘n’ roll like “Alright By Me” and “Gotta Get Away” (probably the hardest rocking song of the bunch). There is one thing that Mike has not changed though: the serious subject matter and emotional subjects brought up in the lyrics. “The Soldier Never Started A War” is pretty obvious by the song title alone, “Wish You Well” is a song about a father seeing his son grow up, “Distance” is about being separated from a loved one (perhaps even having lost a loved one), then there’s the love lyrics of “Prettiest Girl” and “Straight From The Look In My Eyes”. Anyone who is a White Lion fan, or more specifically a Mike Tramp fan, should enjoy this album. 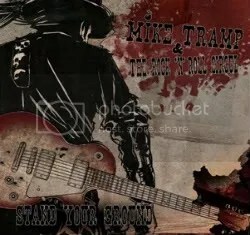 Mike Tramp never really seems to get much press but he’s been active since the ’80s cranking out one good album after another and it’s time people start recognizing that! Buy ‘Stand Your Ground’ at Amazon.com!